De beroemde schilder Norman Perryman staat bekend om het live schilderen bij belangrijke composities tijdens concerten. De schider'performance' is via grote overheadprojectoren op een doek te volgen. Hij doet dit bij grote orkesten over de hele wereld. Castus legt nu een aantal van z'n belangrijke werken vast. Als eerste is de Schidelrijententoonstelling van Moussorgsky gefilmd. Tevens wordt er gewerkt aan een documantaire die rond z'n 80ste jaar zal verschijnen. Norman Perryman was born in Birmingham, England (1933), was educated at the Worcester Royal Grammar School and studied painting and art education at the Birmingham College of Art and Crafts, where he graduated with Honours in1954. He emigrated to the Netherlands in 1957, then moved to Switzerland (Leysin, Villars and Geneva) in 1966. He was Head of Art at Aiglon College (1967-73) and from 1976 –1990 was Chief Examiner for the Visual Arts programme of the International Baccalaureate, designing and developing the arts curriculum and travelling world-wide to give workshops on the role of the arts in education and the relationships of the visual arts and music. He returned to Holland in 1978 and now lives in Amsterdam. 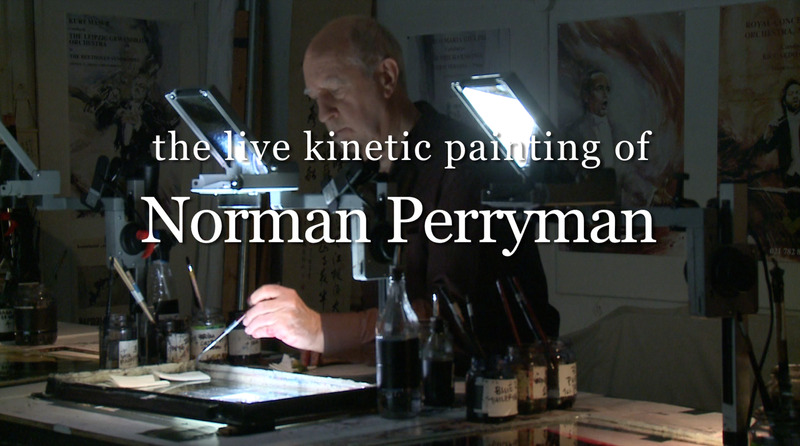 Perryman has exhibited widely (in The Netherlands, U.K., Switzerland, Germany and the U.S.A) and has won international acclaim for his dynamic watercolours. His principal themes are portraits, landscapes, dance and in particular, music. He exploits the fluid transparency of watercolour to convey the illusion of movement and the transient nature of music and dance, his figuration moving naturally into abstract expressionism. Perryman has been expressing his passion for music in his paintings since the early sixties. One of his first subjects was conductor Bernard Haitink in 1965, conducting the Amsterdam Concertgebouw Orchestra. This led to many 'action portraits' of other great musical personalities, which not only convey a likeness - they radiate the illusion of music. The late violinist Yehudi Menuhin, a friend for more than thirty years, once described Perryman as “a musician, who makes music with his brush" (Gstaad Festival Exhibition, 1971). In 1990, Perryman was commissioned to paint a series of large watercolors of musical celebrities for Symphony Hall in Birmingham (UK). This unique Collection now contains nearly thirty paintings of singers like José Carreras, Dame Kiri Te Kanawa, Jessye Norman, Luciano Pavarotti, cellists Yo-Yo Ma and Mstislav Rostropovich, conductors Riccardo Chailly, Valery Gergiev, Carlo-Maria Giulini, Bernard Haitink, Kurt Masur, Sakari Oramo and Sir Simon Rattle, violinists Sarah Chang, Kyung-Wha Chung, Yehudi Menuhin and Itzhak Perlman, pianists Vladimir Ashkenazy and Alfred Brendel. Two selections of these works were published as the Symphony Hall Calendar. Other paintings include the tenor Plácido Domingo (both as tenor and as conductor), violinist Julia Fischer and conductors Sir Georg Solti, Leonard Slatkin and Yakov Kreizberg. A number of these works were shown for the first time to the public in 2001 at the Metropolitan Opera Gallery, New York. Norman Perryman has also undertaken major large-scale commissions, among them the seven metre long mural for the Netherlands Dance Theater (The Hague); 'The Mahler Experience' - a large canvas painted as a tribute to the magnificent acoustics of Birmingham's Symphony Hall; the 203 x150cm triptych watercolour inspired by Elgar's oratorio 'The Dream of Gerontius', unveiled in Birmingham by Lord Menuhin in 1996; and the acrylic painting ‘Enigma’ (inspired by the ‘Enigma Variations’) for the new Elgar Birthplace Museum in Worcestershire (2000). Perryman recently completed his memoir A Life Painting Music (2008), which tells how he became so deeply involved with the world of music, how he portrayed so many great musical personalities and how he performs kinetic paintings to music in concerts internationally. In 1973 Perryman began to work as a performing artist on glass plates, placed on a series of overhead projectors, interpreting music visually in real time. In contrast to the trend of creating digitally generated video-projections, Perryman has developed an economic low-tech alternative that retains the sensual organic qualities of the colours and the gestures of painting by hand. The light of the overhead projectors shines through Perryman’s glass plates to give the transparent colours an extraordinary luminous intensity when projected on a giant screen. As they listen, the audience watches the evolution and dissolution of Perryman’s abstract images. The magnified images from five or more projectors are mixed by hand with an analogue dimmer. Perryman’s semi-abstract, lyrical expressionist visuals are not illustrations, but rather images keyed to the ideas and feelings of the music, enriching the musical experience yet remaining in the memory as powerful works of art in their own right. Perryman calls this art form kinetic painting, because it is a continuously changing sequence of colours and forms that only exists in real time, then disappears forever. His paint-brushes also move to the rhythms of the music and make the liquid watercolour splash, pulsate, pulsate, flow or spread continually. After memorizing the musical score, Perryman paints his kinetic visual sequences to a carefully rehearsed graphicchoreography, although an element of improvisation is always present. The musicians or dancers often stand or perform in these projections, thus becoming totally integrated in the visuals and reacting to them. Perryman’s techniques also provide an experience in synesthesia, (the sensory cross-over where, for example, you see colours on hearing music or hear music in visuals). The spectator is a surprised witness of an ongoing live creative process that is in total harmony with the musical experience. Since 1973 Perryman has performed frequently in this way for television and with modern-dance groups in Switzerland, France, England, the Netherlands and the USA. Perryman made the film Esquisses for Télévision Suisse Romande in 1976. In 1979 he performed his abstract impressions of Vivaldi's Four Seasons for French Television with Yehudi Menuhin. An example of his kinetic painting with dance was the modern ballet Invention (co-created with Philip Taylor) for the Netherlands Dance Theater, to open the 1989 Holland Dance Festival. In 1993, BBC Television made the major documentary Concerto for Paintbrush and Orchestra, about Perryman's life and work with music. The latter part of this programme was devoted to a performance of Mussorgsky’s Pictures at an Exhibition, with Sir Simon Rattle conducting the City of Birmingham Symphony Orchestra in Symphony Hall, where Perryman could be seen painting his own semi-abstract pictures, inspired by and synchronous to the music. 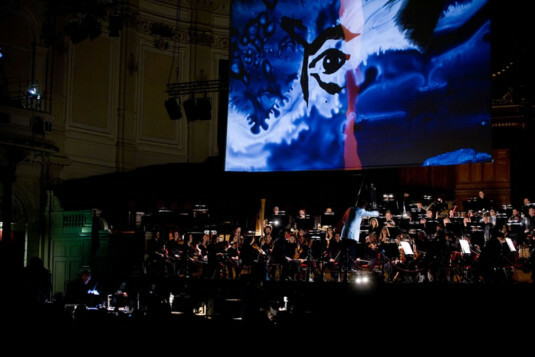 The Times described the performance as “an ingenious audio-visual experiment, with brilliantly conceived imagery”. Perryman has also performed with José Carreras, Amanda Roocroft and the Hallé Orchestra (1994), with percussionist Evelyn Glennie (1998), Holland Symfonia (Ravel) (2004), the Rotterdam Philharmonic (2004), the Netherlands Chamber Orchestra (Stravinsky: The Soldier’s Tale) (2004), the Arnhem Philharmonic (2004) and with the Circle Percussion ensemble in spectacular Kodo-style performances (frequently between 1978 and 2009). In 2005 he appeared with the Flemish Radio Orchestra in a performance of John Adams’ El Dorado and toured Belgium with the Flemish Radio Choir in a programme entitled The Occupied City. In 2006 he performed in Amsterdam in a Dutch version of Gertrude Stein’s chamber opera Dr. Faustus Lights the Lights, with music by Guus Janssen. At the 2007 Connecticut Greenwich Music Festival Perryman performed John Adams’ Hallelujah Junction (with pianists Steve Beck and Andrew Armstrong). He has also performed several times in Abu Dhabi, Dubai and Qatar. Asian painting and music have always influenced Perryman’s work, first in his early watercolours, then in performances. In 2004 he chose Toru Takemitsu’s From me flows what you call Time for a performance with the Rotterdam Philharmonic. In 2005, with the Dutch ASKO Ensemble, he performed Confluences: Concerto No. 4, by the Chinese-American composer Huang Ruo at the Amsterdam International Contemporary Music Week. 2007 saw three concerts with the International Sejong Soloists (Augusta Read Thomas and Takemitsu) in the Great Mountains Music Festival, South Korea. He worked with Huang Ruo in 2008 to create Written on the Wind: a work for pipa, vocals and kinetic images. In 2009 he performed in Amsterdam the first of series with the Chinese trio Min/Wu/Xu.